Jamie Oliver cookware is designed and inspired by celebrity TV chef, Jamie Oliver. He has partnered with a number of companies including Churchill China and Tefal, in order to create ranges of good looking and functional cookware, kitchenware, and utensils. As a professional chef and keen cook, Jamie knows how to create kitchenware that is easy to use and practical. From knife sets that include all the knives you need to be able to create a tasty meal quickly and easily, to over-sized plates and crockery that are perfect for holding larger portions without the risk of food slipping and sliding off the plate. His designs tend to be elegant and simple, uncluttered, so that you can concentrate on the food rather than a complicated pattern. You can also buy Jamie Oliver utensils, Jamie Oliver wine glasses, and items like Baking Beans that simplify or improve the cooking process in your home. These items are the next best thing to having Jamie himself in your kitchen, and because they are backed by some of the best known and most widely trusted manufacturers in the industry, it means that you can buy items that are tough and durable, strong and long lasting. Always check the care instructions to see whether they are safe for use in the microwave, the oven, or the freezer, to ensure that you get as long a life as possible from them. 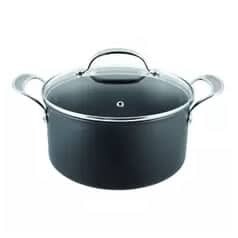 The official cookware website of Dawson's Department Store in Clitheroe, ECookShop has a large catalogue of products for the kitchen and the dining table, including Jamie Oliver kitchenware. Whether you want to be able to cook more efficiently, impress guests with an attractive dining set, or even if you are looking for a heartfelt and attractive gift, we have the products for you. Call in to Dawson's to see our full range, call to ask any questions you have about specific items, or buy using our secure online ordering system. We provide free UK delivery on all orders over £50, which means that you can enjoy even more competitive and convenient pricing when you buy from us. Born in 1975, Jamie Oliver is known primarily for creating wholesome British food. He has been awarded a Member of the Order of the British Empire since appearing on TV screens since 1999. He has been invited to No. 10 Downing Street by the Prime Minister, launched his own high end restaurants, and even hosted a TED Talk in 2010. Although he has courted controversy during parts of his career, Oliver has also hosted shows attempting to highlight the problems with school dinners. And he established the Fifteen charity restaurant, which trains disadvantaged young people to work in the hospitality industry. Buying Jamie Oliver kitchen equipment won't instantly turn you into a celebrity chef, but it can help improve your kitchen experience and your family's dining experience. Jamie has collaborated with a number of companies, creating items like garden furniture and, of course, kitchenware. The Jamie Oliver White collection is a collaboration between Jamie and Churchill China. The company dates back to 1795, when it was established in Stoke-on-Trent. 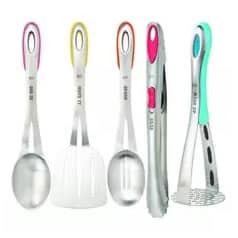 They provide high quality and durable kitchenware to the hospitality industry, and their products have also proven very popular with keen home cooks because their products are attractive, clean looking, and they are durable and hardy. The Churchill White collection is a collection of generously sized crockery. It includes dinner plates, bowls, salad plates, cups and mugs. You can buy a 16 piece starter kit which consists of 4 small plates, 4 large plates, 4 bowls, and 4 mugs. You can also buy additional items to expand the size of the collection or to replace damaged pieces. There are pieces like ramekins, butter dishes, and platters. These aren't included in the dinner set but they make very useful additions to your collection. The pieces are designed in a brilliant white, as the name suggests. They have clean lines and an uncluttered design which has made this collection popular with a lot of homeowners and home cooks. The Fluted Blue range is another collaboration between Jamie and Churchill China. Although the line has been discontinued now, we still have a selection of items from the range. 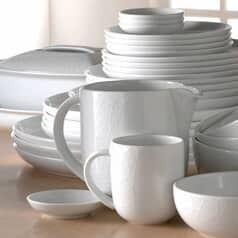 If you need to replace a damaged or lost item, or you simply want to buy good looking crockery and kitchenware, this is the ideal range for you. The platter and rice bowl set is a stoneware set that has a 12cm rice bowl and 32cm bowl. The collection is dishwasher safe and microwave safe. It can be used for eating from, or it can be used to serve antipasti, breads, and dips. The design includes duck egg blue rims and subtle speckles. It has an elegant and classic look, and it is perfect for entertaining or for your own use at home. As well as being known for his cooking skills, Jamie is also known for his Essex style and language. The Jamie Oliver Cheeky range is yet another range from Churchill China that is made using Jamie's designs. The Cheeky range are Jamie Oliver products that make superb gift ideas. The mugs and mini mugs are made from the bone china that Churchill is known for. They are durable and will last a lifetime. The Cheeky Range of mugs are plain white, chunky mugs, and they include slogans like COOL DUDE or DEAD HANDSOME. Following the success of the original mugs, additional items like plates and small plates have now been added to the collection. 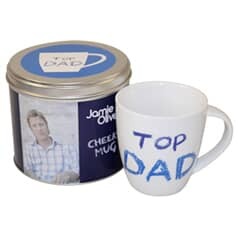 If you are looking for a gift for birthdays, Mothers' Day, Fathers' Day, or for any other occasion, the Cheeky Range from Jamie Oliver provides everything you need. DKB is a manufacturer of utensils and cooking accessories, and they have partnered with Oliver to create a range of Jamie Oliver kitchen accessories and utensils. Sets of measuring spoons, slotted spoons that are great for easily serving pasta and spaghetti. Baking beans are a useful accessory if you're baking blind, serving as weights inside pies and tarts during the cooking process. Cookie cutters and fluted cookie cutters, icing bag and nozzles, and sandwich tins are just some of the other accessories that have been designed by Jamie and produced by Swiss manufacturer DKB. Jamie Oliver kitchen utensils are an ideal gift for the home cook or keen chef in your family. They make a great house warming gift, and their quality and durability means that they are also perfect for use in your own kitchen. Yet another collaboration, this time between Jamie Oliver and pan manufacturer Tefal. The innovative company manufacturers frying pans, non-stick pans, and a host of other kitchen accessories. The Jamie Oliver pans and Jamie Oliver saucepans are made with the same non-stick qualities as other Tefal products. Enjoy convenient cooking, generous pan sizes, and a traditional Tefal pan design backed by Jamie's name. Jamie Oliver rocketed to fame before the turn of the century, after being discovered by the BBC. He has embarked on campaigns to try and improve school dinners and to teach people how to cook wholesome and healthy meals at a fraction of the typical cost. He has opened multiple restaurants, and his popularity has led to many collaborations between Jamie and well-known manufacturers in order to create several successful Jamie Oliver kitchenware ranges. ECookShop is the official kitchenware website of Dawson's Department Store. You can call in to see our full range of items, including other homeware sections and garden furniture. You can call us to speak to one of our friendly and experienced team, or you can buy through our secure online ordering system. If you spend more than £50 on your order, we will deliver to your UK address free of charge which means that you can enjoy access to even more competitive prices on some of your favourite items. I have had so much fun cooking the recipes from your 30 minute meals and using these pans in all my years of cooking I never realised how much easier life would be using exceptional cookware. Wish Id invested in them sooner. They are fantastic and I would recommend them to anybody who enjoys cooking great to use and easy to clean.